Install shortcuts never pay off! Close this window & login to get the goods! Request Access (pros only!) | Lost Password? 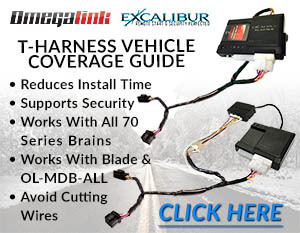 Click the image to download our vehicle compatibility guide for OmegaLink 'OL-HRN-RS' T-harnesses. They allow you to use OL-BLADE-AL or OL-MDB-ALL with any 70 series remote start! To see install guides, use the vehicle lookup above or login and go to our Install Guide Server. Click the thumbnail image to browse our interactive 2018 Excalibur catalog. This new edition contains all Excalibur Systems, NEW RK kits for A La Carte system design, Analog T-harnesses, Key Accessories and more! - Download PDF version here. Linkr-LT1 & Linkr-LT2 (coming soon with 4G LTE speed) cover 90% of your customers' needs at half the price. Get full featured control, alert, tracking, AND the first year of service included for the price of competitors' service alone! 8/10/18: Several vehicles added and new Interactive Excalibur Catalog published. 3/5/18: Over 100 vehicles have been updated on wiresheet.com the past 2 weeks. 4/12/17: Linkr activation long delay problem has been fixed. Subscriptions can be purchased 15 minutes after installer clicks FINISHED on the test page. This step MUST be done. 5/27/16: A bug that prevented the feature/accessory toggles from working in Safari has been corrected for all you Mac users out there. © 2018 Omega Research & Development Technologies, Inc. All rights reserved.